A Westbrook Junior College student stands in front of a tree on the campus Green with Alumni Hall behind her in this sepia toned candid snapshot labeled "Last Chapel" on the front. On the back is written in blue ink: Shirley Cole 36. 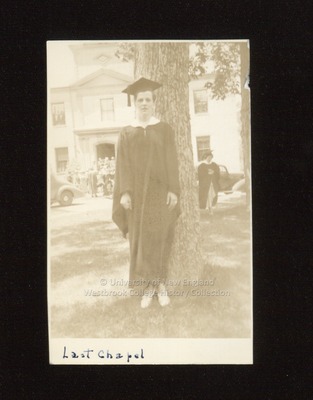 Shirley wears her graduation gown with white collar and mortar board cap. Other students exit Alumni Hall in graduation caps and gowns. Automobiles are parked along the College Circle in front of Alumni Hall.